Sowerby Bridge is a Pennine town in Calderdale which lies immediately adjacent to Halifax. The skyline here is dominated by the ornate chimney-like structure of Wainhouse Tower - almost certainly the largest of several Victorian follies which were built as viewpoints in the area. Branwell Bronte worked at Sowerby Bridge's railway station as assistant clerk before being appointed clerk in charge up the line at the station for the nearby village of Luddenden Foot. Also nearby is the Pennine village of Hebden Bridge with its deep wooded valleys and moorland so typical of West Yorkshire's Bronte Country. South east along the valley is Ripponden from where the trans-Pennine A58 route passes by the reservoirs of Blackstone Edge Moor and Blackstone Edge itself before descending in to Lancashire. 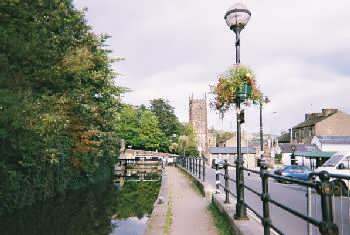 Another trans-Pennine route, but in this case a waterway, the Rochdale Canal connects Sowerby Bridge with Lancashire.